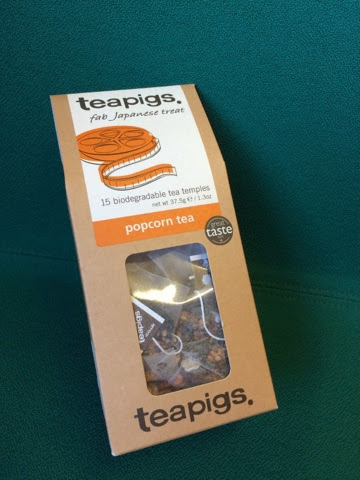 A while back I got sent some TeaPigs popcorn tea as part of the Matcha Tea review package. I took them to work and they got buried in a draw. As the colder weather has drawn in I have found myself upping the tea rations and exploring all the things I had. This sat undrank until I felt just the right kind of adventurous today. I'd previously had some Genmaicha tea which is very similar to this and not really enjoyed it. I think it's dark earthy taste contrasted too starkly with the sweet chinese meal and drink if had next to it causing this bias. Today I was careful to not make it too strong as a first attempt, but also not to add sugar so I could get the full flavour. To my surprise I quite liked it, the brown rice that gives it the distinctive earthy flavour was still the dominant flavour but it was more balanced than if expected. I think that this tea would be a favourite for coffee drinkers or smokers who prefer dark flavours, as it doesn't really taste like a tea at all. I'd much prefer to have a nice delicate cup of jasmine green tea or similar to this on 90% of occasions but I think that as a warming winter drink this works well. As the original version of this tea I tried was bottled and therefore cold I think this is best enjoyed for me after a long walk in the snow or rain. It may be one therefore to look out for in cafes after walks. I won't struggle to make it through all the teabags, but any that don't get used this winter will likely be kept til the next one.